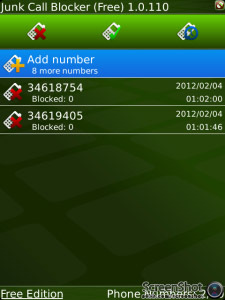 Junk Call Blocker is a smart application that adapts from your call list to allow you to select specific phone numbers to block. Save yourself the headache of having to deal with junk calls by blocking them with this app! This is a BBM™ connected app. If you like Junk Call Blocker please write a review. Thanks. With this free version, you can keep up to 10 numbers on your customized block call list. An option to increase this limit is available inside Junk Call Blocker.